Built in the Astilleros Celaya shipyard in Bilbao, Spain, the barque Simón Bolívar was launched on November 21st, 1979 and commissioned the following year, on August 12th. She was one of four barques built by the same shipyard for the four Latin American navies; Venezuela, Mexico (Cuauhtémoc), Columbia (Gloria), and Ecuador (Guayas). View aboard the Simón Bolivar. June 2016. 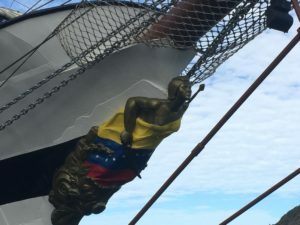 Considered to be Venezuela’s “Ambassador of the Seas”, she has participated in numerous tall ship exercises around the world, including Operation Sail and the International Americas’ Sail Tall Ship Race (where she won gold in 1995). She is classified as a “Class A” tall ship, meaning she is a square rigged vessel and over 40 metres in length. Far from her home port of La Guaria, Venezuela, she was visiting St. John’s as part of the Venezuelan Navy’s “XXVIII Foreign Training Cruise EUROPE 2016” exercise. She stayed in the city for four days and was open to the public for tours. Her crew was quite friendly and (with the aid of Google Translate) more than happy to answer any questions. She left St. John's and sailed for Europe; at the time of this writing, she was underway from Le Havre, France to Lisboa, Portugal. Safe travels to her crew, and hope to see you all again!